Meet La’ James International College – Cedar Falls graduate Chelsea Taylor. Chelsea graduated from the Cosmetology program earlier this month… Congratulations!!! We asked Chelsea to share some of her experiences. Chelsea took home 2nd place in the Contemporary Classic category. 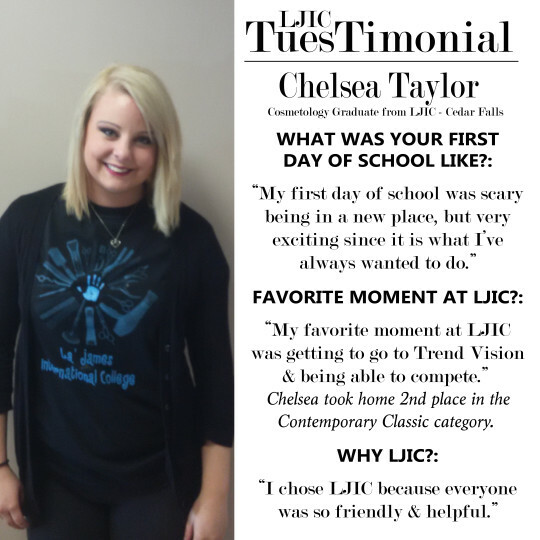 Thank you Chelsea for sharing your experiences and for participating in this week’s LJIC TuesTimonial! Are you interested in learning more about the beauty industry? Call 888.880.2108 or visit www.LJIC.edu today!